So you’re interested in gearing up and hitting the trails for an off-roading adventure. You’ve probably gone along with friends before and are now on the hunt for your own 4×4 vehicle. Getting into the sport of 4×4 off-roading can be a fun, adrenaline-inducing activity for experts and beginners alike. But if you’re new to the trails, you’ll need to learn some basics before leading the pack in your own 4×4 vehicle. In this post, we’ll go over basic information and tips for off-roading beginners like you so that you’re not left with a busted truck or a broken arm. Choosing the right vehicle for your off-roading adventures may take some time because you want to make sure you get the right kind of vehicle with the right kind of modifications. Most of these options can be found used for under $5k, though some (like the Landcruiser) might cost you a little bit more unless you find one with higher mileage. Some of these models will be pricier than others because of their name (a Toyota will cost you more than a Suzuki), but depending on your budget and the terrain you want to traverse, any of these 4×4 vehicles can be a great option. Just be sure to do your research and get the best vehicle for your budget. You don’t want to buy the lowest-priced bargain because it might have some costly repairs to add to the price tag. At Colorado Axle and Gear, we modify and repair vehicles – so if you do find a great deal on one you can bring it in for an upgrade. For example of a total cost, you may end up with a used Jeep or Nissan for $4,000 or $5,000 purchase price. Bring it in for a lift and some new tires and you could potentially have your first 4×4 vehicle for under $7,000! 4×4 High: 4 X 4 high, the most commonly used four-wheel drive mode. Unlike 2-wheel drive, each of the four wheels are being powered by the powertrain. The phrase “High” refers to the gear ratio which is unchanged from the ratio used in 2 wheel drive. 4×4 Low: Most commonly used in rock crawling, getting unstuck, and driving up steep inclines with poor grip, 4×4 Low is a drive mode where a lower gear ratio is used. This reduces the top speed of your vehicle while converting that extra power to deliver higher torque to the wheels. Approach Angle: The maximum angle that a vehicle can climb before the terrain meets the vehicle’s undercarriage or bumper. You’ll get to know this term well when practicing on new trails and encountering rocks and dips. Articulation: In other words, how flexible is your suspension? If your vehicle has more articulation, you can cross over rocks, holes, and roots much better than a vehicle with lower articulation, or suspension movement. Locking Differential: Commonly referred to as a diff lock, a locking differential refers to the speed at which the wheels are turning. When you are off-roading in a normal 4×4 mode, the wheels will spin at different speeds in order to compensate for flakey and uneven terrain. However, when the differential is locked, all of the wheels move at the same speed. This is trick best left for advanced off-roaders or pulling yourself out of a tight spot. Wheelbase: The distance from the center of your vehicles front wheel to the center on the rear wheel directly behind it. Rock Massage: A very accurate term used to describe what happens when your ego supersedes your off-roading abilities and things go south. You’ll want to be sure to learn some new vocabulary so that off-roading is not only more fun but also safe. Air Down: Simply put, to lower the air pressure in your tires. This will help with traction when going off road. Off Camber: A trail that is “off camber” means that it has a steep incline to one side. The outside of the trail might be higher than the inside, which can lead to a rollover if the driver is not careful. Wheel Travel: This is the distance that a wheel can travel up or down. If your vehicle has more wheel travel, or better suspension, you’ll have better traction on the trail. To stay safe and have fun on the trail, you’ll need to make sure you’re covered with essential supplies. First, don’t forget to fully fill the gas tank! You never know if you’re going to get stuck – or even lost – when out on the trail, so best to be safe and keep the tank full in case you’re out longer than anticipated. You may even want to pack a spare tank of fuel if you’re going out for a weekend off-roading camping excursion. A friend – don’t go alone! If you are going for your first time or are unsure about the area in which you will be off-roading, here are a few recommended extras to make the trip go smoothly. As a 4×4 off-roading beginner, you may want to start with the easier trails to get to know your vehicle and the land. Trails are typically marked with a difficulty level from low to high. When looking for a trail to tackle for the day or weekend, make sure to do your research to see which trail or set of trails have an easier rating. Even if you’ve ridden with friends 100 times, driving your own 4×4 off-road vehicle comes with a new set of challenges, so better play it safe than sorry by choosing some easier terrain for your first few off-road excursions. Before diving in, you may want to take your 4×4 vehicle out for some practice rounds. Find some easy-going dirt roads or fields where you can practice handling your vehicle, but the risk of getting stuck, rolling, or bottoming out is low. You can even take a course in 4×4 off-roading by finding a company that offers lessons. Perhaps renting a 4×4 vehicle and taking a lesson before diving in and purchasing your own trail-blazing 4×4 will prep you better for knowing how to handle the truck and the terrain. Always remember, safety first! 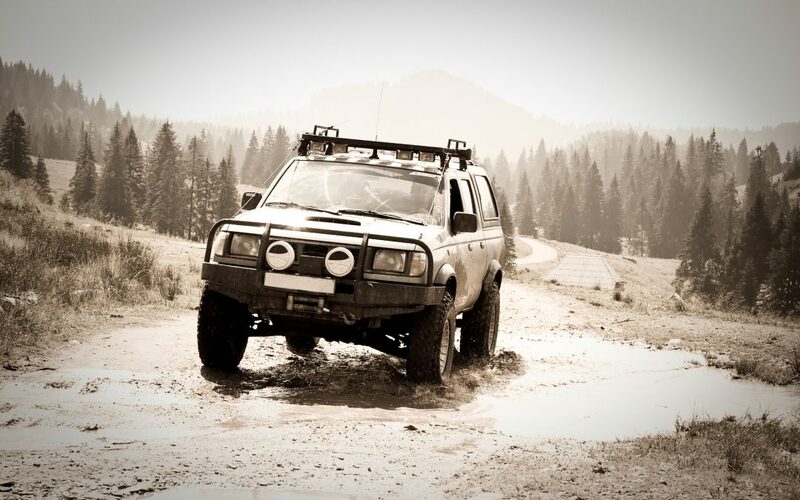 Make sure your 4×4 off-road vehicle is well-equipped to run smoothly. Do not forget your essentials and your safety kit, along with extra water and food. Make sure to take a friend (or a group) on your off-roading adventure in case of emergency. You never know when your 4×4 truck might break down, bottom out, or if you will end up needing a tow – so going with others is always a safe move for a fun, 4×4 off-roading adventure! Before you get started with your off roading journey, it’s important that you have a few “Yodas” who can guide you and teach you the ropes. It’s also important to find and befriend a local expert so that you can find some of the more hidden and off the beaten path gems that your state undoubtedly has. Here are my 3 favorite places to find off-roading partners and communities. There are TONS of forums and vehicle specific online groups that you can turn to for off-roading information. This will become very important as you begin making progressively more challenging vehicle modifications. Many of these forums also host in-person meet and greets on a regular basis so that you can meet local off-roaders, enjoy a buger, and make some new friends. If you live somewhere with decent off roading trails, then you can undoubtedly find a high-quality local group that will host weekly training runs for beginners. These training days are an excellent chance to confidently dive into the world of off-roading with a more advanced individual taking you under their wing. Off-roaders are a cultish group when it comes to their vehicles. As such, it should come at no surprise that there are a plethora of manufacturer-sponsored meetups and events hosted all over the country. From the Jeep Jamborees to the Land Rover Experiences, there are dozens of associations and events you can find where you can connect with other off-roaders, take private driving lessons, or take part in a full day driving school. Driving a well-worn trail is, by far, the best way to begin your off-roading journey. It’s simple, safe, and provides the perfect environment for a beginner to become comfortable with all of the nuances of driving a vehicle off-road. There are a number of state and federal parks that have dedicated off road trails that are perfect for the novice 4×4 enthusiast. Do some research and ask around your local off roading group to find some hidden gems that are still suitable for beginners. And remember, be safe and don’t attempt anything you aren’t confident about without an experienced driver. When it comes to driving on sand, the most important thing to remember is that grip is king in the dunes. This means that you will need to deflate your tire pressure down to 15-20 PSI (check with a local expert for advice on your specific tires). Avoid slowing down unless absolutely necessary as keeping momentum will stop you from getting stuck in soft sand. If you do start to sink into the terrain, rapidly turn your wheels left and right to regain traction and keep your vehicle mobile. There’s a reason that most people associate off-roading with muddy vehicles.. Becuase mud is FUN! However, just because a good time can be had by all doesn’t necessarily mean a good time will be had by all. Driving through the mud is dangerous business and a single mistake can end very badly very quickly if you aren’t careful. The biggest problem with driving in the mud is that once your vehicle loses traction and begins to slide, you have a 0% chance of regaining control until the terrain wants you to. When it comes to the specific tactics of off-roading in the mud, the standard operating procedures are more or less the same as they are in the sand. Maintain momentum to avoid getting stuck, move your wheel left and right if you feel yourself sinking, and last, but most importantly if you feel yourself sinking do NOT floor the pedal. This will only dig you deeper into the mud and may require that you are winched out of the mess. Off roading is one of the most fun and rewarding experiences that can be had. If you do it right and follow the tips shared in this guide, you will be well on your way to enjoying an incredible new hobby that will bring you laughter and community for years to come.